.....is it me you're looking for? Microsoft's cloud services Outlook and SkyDrive have been restored after an outage that lasted for three days. The outage began around August 14, with users complaining that they had issues connecting to Outlook.com SkyDrive and People services until yesterday. "This incident was a result of a failure in a caching service that interfaces with devices using Exchange ActiveSync, including most smart phones. The failure caused these devices to receive an error and continuously try to connect to our service. 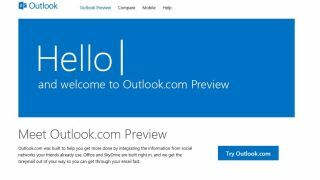 This resulted in a flood of traffic that our services did not handle properly, with the effect that some customers were unable to access their Outlook.com email and unable to share their SkyDrive files via email." Having identified the problem, Microsoft went on to explain that it had made two key changes to "harden" its systems against future failure. This includes increasing bandwidth in the affected part of the system and improving the way error handling is done for devices using Exchange ActiveSync. After posting the explanation on Microsoft's service status webpage, another problem report was posted soon after explaining that some mobile users may have issues syncing emails.